This is the last post in a larger series. 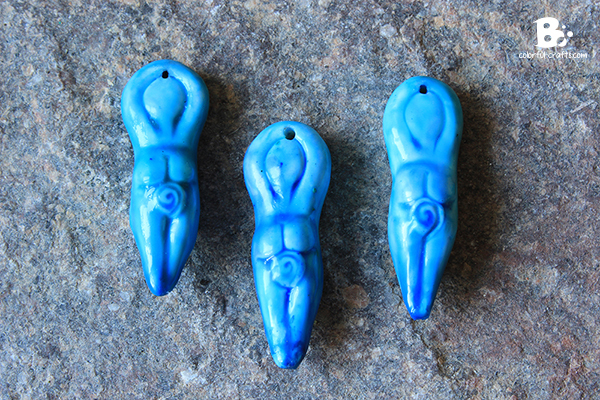 Here are the other entries, if you want to check them out: How to make a Goddes Pendant with Polymer Clay. 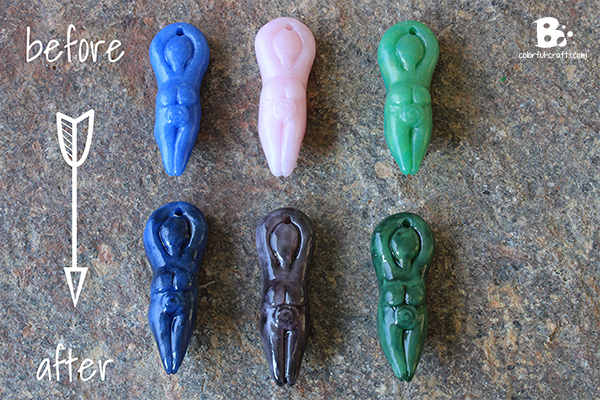 Make your own Polymer Clay Mold. 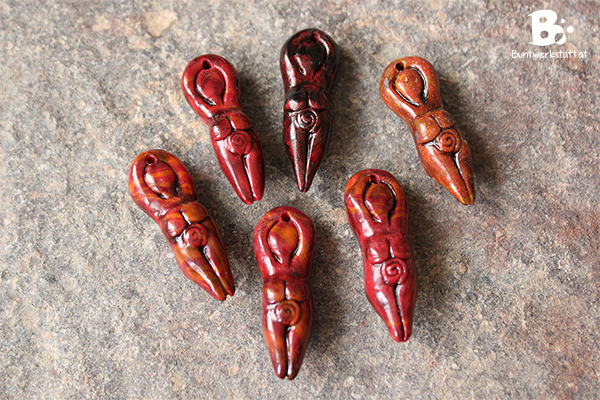 How to make Elements of Nature Pendants with Polymer Clay. 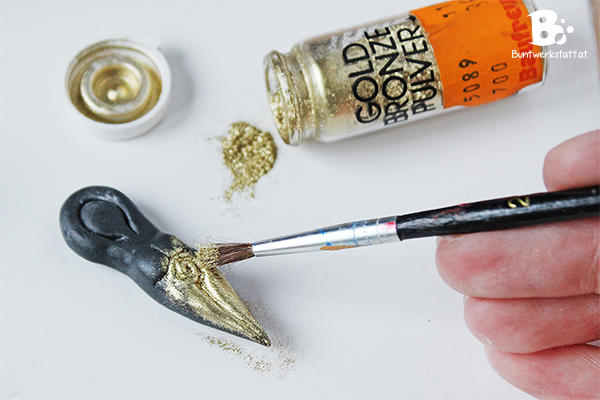 For really cool metallic effects add metallic pigments (available here*) with a soft brush. 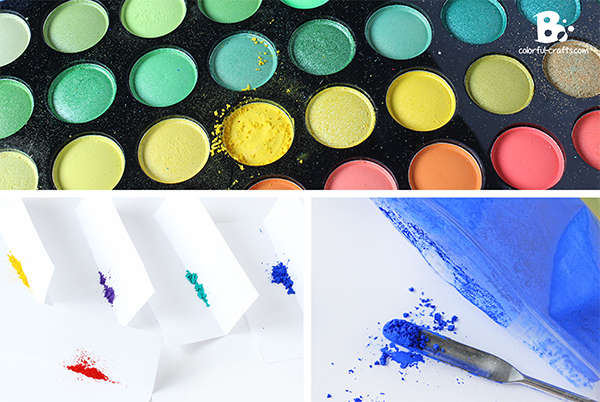 You don’t have to use those exact brands, but be sure to use only pigments which are suitable for crafts like that. 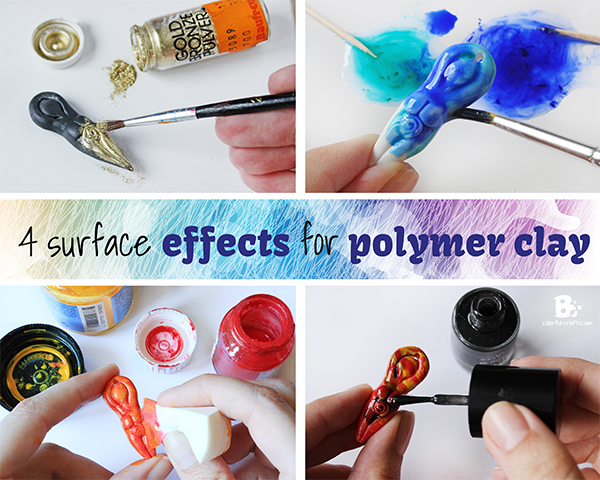 Apply the powder directly to the unhardened polymer clay. The pigments will stick to the surface without the help of glue or varnish. Bake the polymer clay as instructed on the package and apply some glaze (available here*) for a glossy finish. You can play around with the amount of pigment. I used a lot of powder on the left figurine, a medium amount on the middle one and just little bit on the figurine on the right. I like how the color of the polymer clay is visible through the thin layers of pigment. I love this effect! The polymer clay looks like it has some kind of ceramic glaze. It works best on structured surfaces, because the pigments of the “glaze” will settle down in the little grooves. The other thing you will need are pigments! You can buy loose pigments in the craft store, or in a shop that sells ingredients for natural cosmetics. If you can’t find any there, you can also use highly pigmented eyeshadows. Just scrape off a little bit on a folded paper. The pigment will collect in the fold and you can distribute it easily to where you want it. If you don’t want to use pigments, you can use alcohol ink (available here*) instead. 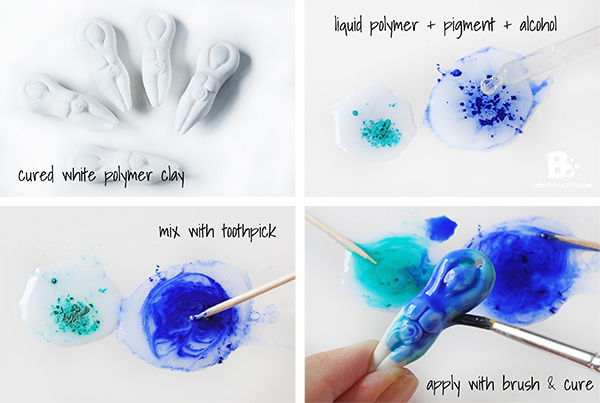 Use white polymer clay pieces to get the best results. You can experiment with other colors too, but the pigment will show up better on a light surface. Mold the polymer clay and bake it as instructed. Once it has cooled down, you can start to apply your “glaze”. Use an old tile or plate to mix everything togehter. Put a large drop of liquid polymer on the plate, add some of the loose pigment and a few drops of rubbing alcohol. Mix everything together with a toothpick. The pigments should dissolve in the liquid polymer with the help of the alcohol. Apply your glaze thinly with a brush. A pointed one with synthetic bristles will work best. Bake everything again according to the product instructions. 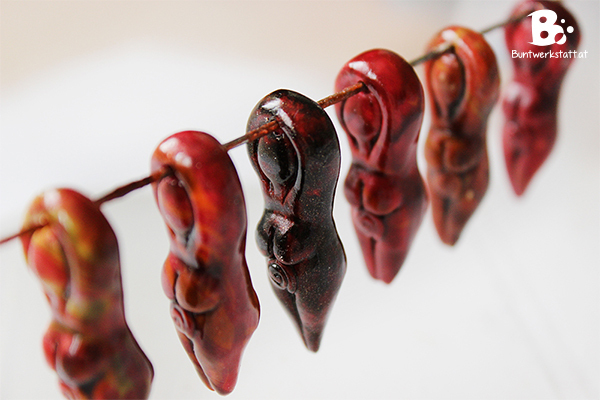 Bear in mind, that the liquid polymer will become very “runny” once you put your pendants in the hot oven. 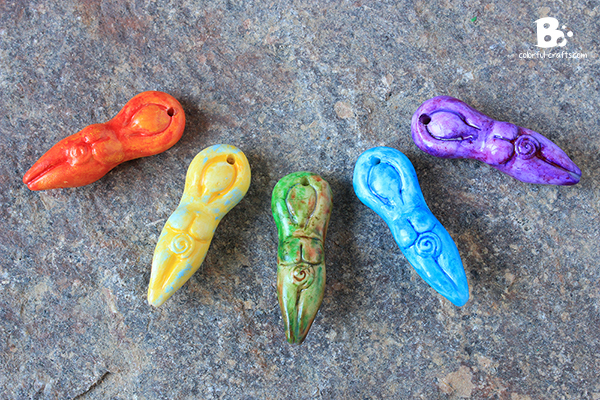 It will run down the sides of the pendants, beads or whatever you are making, and solidify there. For this reason this technique is best suited for pieces you can lay down flat, like those ear studs I made. You can paint on polymer clay once it has cured. 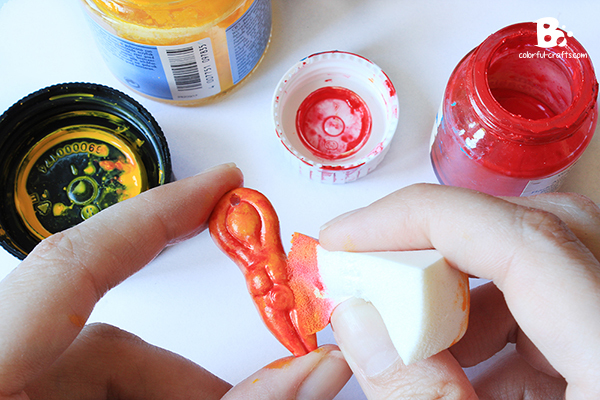 Before you start you should apply a thin layer of clear varnish to seal the polymer clay. For this watercolor effect you need a sponge and acrylic paints (available here*) Mix your paint with water and dab it on with the sponge. It works best if your pieces are made of white polymer clay. The layers of paint should be applied so thinly that the color of the clay shows through. Layer different shades of colors over each other to enhance the effect. Let everything dry and add a little more paint. 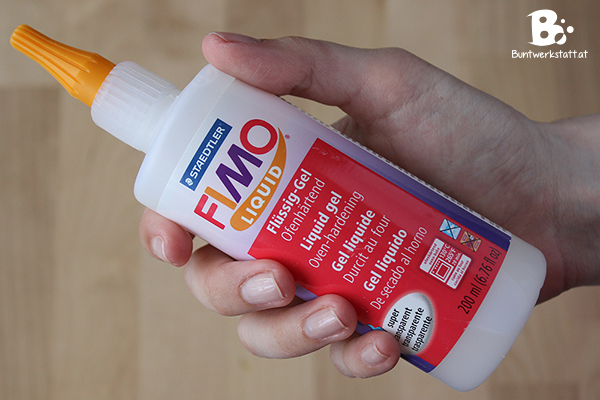 Just make sure that your paint is mixed generously with water. 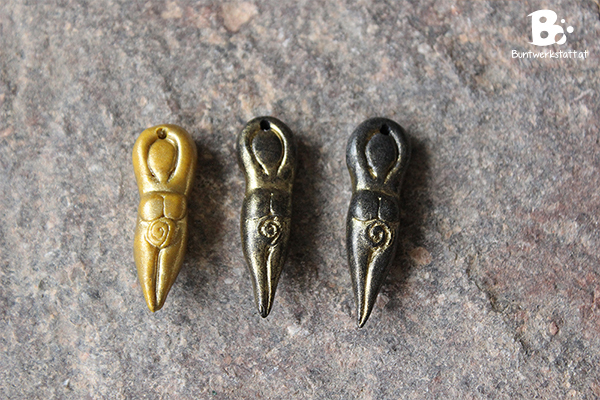 I think those pendants turned out really nice. I applied a final layer of clear varnish for a glossy finish. You can add a smokey effect to hardened polymer clay pieces simply by applying black nail polish. Use one that has a “jelly finish“. Nail polishes like that are very transparent and the color of the polymer clay will still show through. 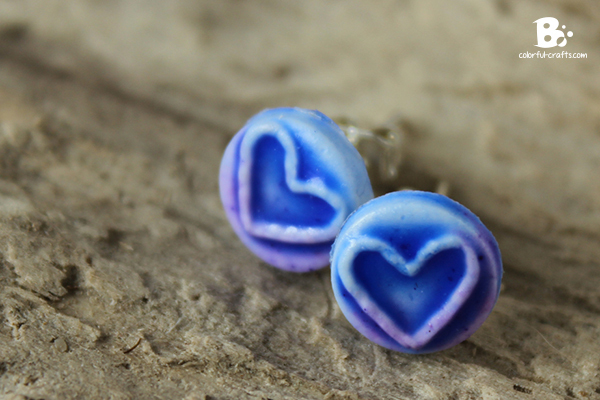 Tip: Before you coat polymer clay with nail polish you should add a layer of a suitable glaze (available here*). Otherwise the polymer clay could start breaking down over time. I really like this technique because it gives the pieces a kind of dirty, smokey look. If you don’t have a nail polish that is transparent enough, mix a little clear nail polish with a drop or two of black polish. I really like this effect with red polymer clay. But it is also very pretty with other colors as a base. In this picture I used “Fimo Effect” gemstone colors (available here*). From left to right: agat blue, rose quartz, jade green. Ack! Barbara! 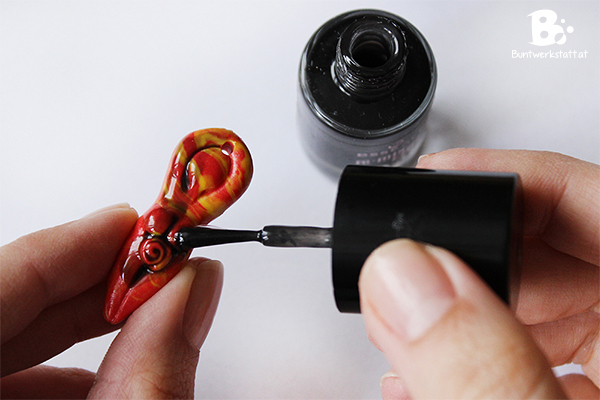 Nail polish can’t be used on polymer clay. It has solvents in it. They’re currently dissolving the clay, and in a few months, you’ll discover that your objects coated in nail polish are sticky and ruined. You CAN use nail polish meant for acrylic nails (it doesn’t have solvent in it), but your average nail polish WILL ruin your clay items. It takes a few months, but they’ll be sticky, gooey, and ruined (because they can’t be fixed once the solvents have melted them). You don’t hafta take my word for it; good “polymer clay nail polish sticky” to read the horror stories. I’m sorry; I forgot to mention the proper glazes for polymer clay: water-based glazes (Varathane is the favorite by a wide margin), Future Floor Wax, Protect Your Memories II (also referred to as “PYM II”), and even liquid polymer. I meant “Google,” got good. Oops. By the way, I love your photo! You’re really cute, and it’s a great photo! I attempted your “ceramic glaze” technique, my “glaze” wasn’t nearly as watery looking as yours!? As I was painting it on it was clumping up did I not add enough of something? I felt like I had to keep adding alcohol to loosen it up, where did I go wrong? Too much pigment maybe? hmm… this is tricky. I also had some pigments, that wouldn’t quite “dissolve” the way others would. For example I had a red, natural pigment and that was a total failure. If the pigments don’t dissolve to a nice liquid when I mix them with alcohol, I don’t even bother to add liquid polymer. Some just don’t work out nicely regardless what you try with them.